We had a photo competition here in amdocs and one of the categories was “dreams”. I did a lot of research on the net for an idea and one of the photographs which i found (actually on a photoshop site) was that of a guy appearing transparent in a photograph titled dreamy. I liked the concept and wanted to get something similar done without photoshop, as the competition had strict guidelines about the use of photoshop. Vidhya came up with the idea of “Dreaming about you” wherein she is seated appearing to be asleep and i appear in the photograph like a ghost which will give the indication that she is dreaming. The camera was put in Shutter-Priority mode i.e. a mode where you can control the shutter speed and the camera handles everything else. I used a shutter speed of 10 seconds. This can be anything based on the effect you want. When the room is dark, Vidhya goes and sits on the sofa. Then, i click the shutter-release button (basically, take the photograph). Then, a light (preferably a powerful one located such that it doesnt put Vidhya in a shadow) is switched on for a fraction of a second and immediately switched off. Because of this action, the room (including Vidhya) are exposed on the camera. Then, i go into the frame, position myself. Then, the light is switched on and off (like the first time). Here is the logic behind the photo: Since i and the background behind me got exposed during the 2 times the light was on, i appear to be transparent in the photograph. Few things to get this photo right: Vidhya had to be dead-still during the 10 seconds. Otherwise, her changed position would get exposed when the light is switched on the second time. Get a background which can covey the transparency well. We took a lot of attempts to get this right. First, Vidhya was not happy with my position in the photograph and complained a lot about my posing skills. Then, we moved around the props in the room till we were satisfied with the overall composition. Sometimes the switching-on-and-off action was too fast resulting in a dark picture. In other cases, the switching on happened a little earlier than expected resulting in my movements getting exposed in the photograph. At one point i got bored with the same pose i was giving and we wanted a different look to the picture. Lokesh and Sarvesh posed for us and it turned out to be a great photograph. We wanted to submit this photograph calling it “Nightmare”. It was a tough call for us deciding which one to submit for the competition. This technique can be used to produce some very interesting pictures if you think out-of-the-box! 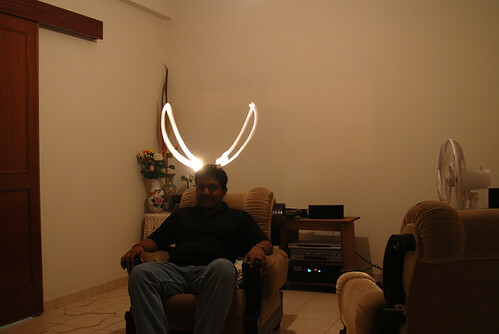 Look at the picture below where Lokesh posed and then i went into the scene with a keychain light and drew the horns on him. Great idea…I knew about overlapping image techniques, but never personally tried it anytime. What camera did you use ? And, what kind of camera should i use to get this effect ? OMG! Can someone PLEASE let me know how EXACTLY to take these kinda pics? They are so SUPER cool! PLEASE!!!??? Nice idea and a great try. Can feel hard trials behind the success here.